Chinese publisher Shandong Education Press held an event at the 2018 Bologna Book Fair to launch its new ‘BIB Award Winning Series’ of picture book illustrations and a Nepali rights deal for education series ‘Different Math Stories’. 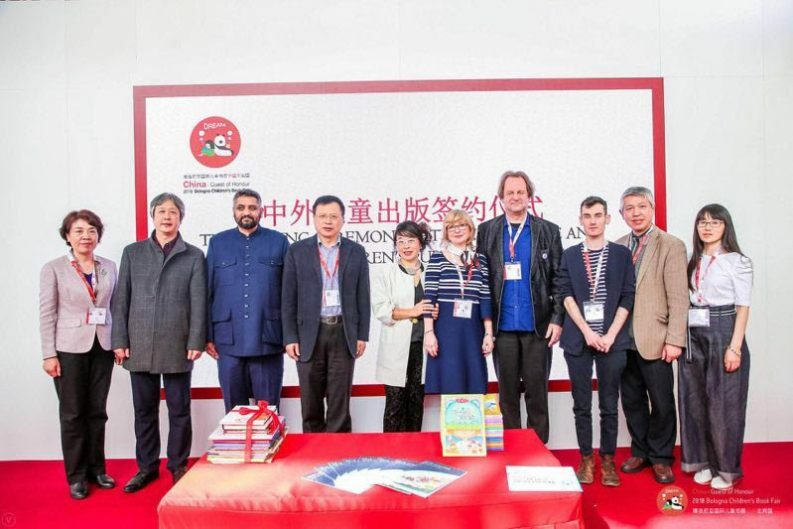 On March 28, 2018, at the 55th Bologna Children’s Book Fair in Italy，Shandong Education Press successfully held the launch event for its Biennial of Illustrations Bratislava (BIB) Award-Winning Series and the copyright export signing ceremony of six-title series, Different Math Stories, with Current Publication Pvt. Ltd. in Nepal. This is a new step in the efforts of Shandong Education Press to be actively involved in the transformation of the domestic book market with an orientation toward high-end children’s books and in copyright cooperation with overseas publishers to introduce those books in China. Among the attendees were Mgr. Viera Anoskinova, Head of the BIB Secretariat; Wally de Duncker, leading Belgian author and current President of the International Board on Books for Young People (IBBY); Kiran Gautam, General Manager of Nepal’s Current Publication Pvt. Ltd.; Chi Yun, Editor-in-Chief of Shandong Publishing Group and Member of BIB International Committee; Yu Rong, famous illustrator and BIB Gold Apple award winner; Fei Jia, senior publisher and renowned artist; Jiu Er, promising illustrator, Ludwig Volbeda, 2017 BIB Grand Prix award winner; Zhang Kewen, President of Anhui Children’s Press; Liao Xiaoyong, President of Jiangxi Education Press, Li Jin, President of Shandong Fine Arts Press; and Tian Siyuan, copyright manager of Beijing Bridging Consulting Services Co., Ltd. The Biennial of Illustrations Bratislava (BIB), one of the most prestigious awards for original illustrations of children’s books in the world, has successfully held 26 sessions since 1967. It operates under the guidance and support of UNESCO and IBBY. Its winners represent the top level in international children’s book illustration. Shandong Education Press has been officially authorized by the BIB International Committee to become the first Chinese publisher to translate and introduce its award-winning books in China. The 16-book BIB Award-Winning Series features the works of the winners of the BIB’s Grand Prix, the BIB Golden Apple, and the BIB Plaque awards. The books feature the world’s top-notch illustrators, and provide artistic and aesthetic nourishment for readers. Ms. Zuzana Jarošová, Chair of BIB International Executive Committee, and Mr. Fang Weiping, renowned Chinese expert on children’s literature, are the consultants of the series, and Mr. Liu Haiqi, a well-known publisher, is the editor-in-chief. The publication of BIB picture books has helped to build a bridge between illustrators in China and the rest of the world, and it has revealed the diverse artistic features of BIB picture books to the world. It is important to open the eyes of Chinese readers and to promote the development of original Chinese picture books at home and abroad. Different Math Stories is a series of six original, creative, and exploratory popular science books. Through funny and fantastic stories in a wild card classroom led by a mysterious teacher with magical powers, the books combine education with entertainment. The series has sold a cumulative 70 million copies and was included in China’s 30 Best Books of 2015 by the China Publishers Association. A Korean translation is also available. Shandong Education Press has endeavored to develop more content based on their IP. The animated film version of Different Math Stories is being broadcast on the iQIYI education channel in China. The successful licensing of the Nepali language version to Nepal’s Current Publications Pvt. Ltd. is just one of the many international projects that Shandong Education Press has undertaken as part of China’s Belt and Road initiative. In recent years, Shandong Education Press has adhered to the goal of pursuing specialized, personalized, market-oriented, and internationalized books in an effort to transform its market from educational theory books, textbooks, and tutorials to original children’s literature and high-end picture books. In the next step, Shandong Education Press will make further efforts to ensure the successful publication of its book series, to sign more contracts with BIB award winners, and to further hold BIB exhibitions. The Press will also invite professional storytellers to promote BIB picture books at schools by interpreting their meanings and artistic value for picture book lovers of world-class illustrations. This article is part of a content cooperation between China Publishers Magazine and Publishing Perspectives with the goal of making available more information about the Chinese book market. China Publishers Magazine is a Beijing-based trade magazine for the Chinese book publishing industry. The magazine is part of China South Publishing & Media Group, headquartered in the Hunan Province. Through a cooperation with Publishing Perspectives, we bring you more information in English about the Chinese book market.